The endeavour is to instil pride and enthusiasm in the present day youth - a youth morbidly impressed by the wrong influences, drawn to drugs and wallowing in mediocrity. Establish an academy staffed by Nihangs to impart training in gurbani santhya, horsemanship and shastar vidya (martial arts). Train in Olympic disciplines of equestrian and fencing so the trainees may compete at national and international levels thereby opening new vistas for them. Organize traveling photo exhibitions documenting the rich Punjabi heritage. 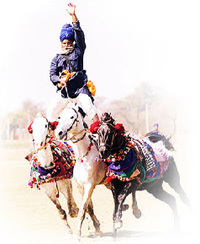 Competitions in kavishri (poetry), horsemanship and shastar vidya will be planned in villages all over Punjab. Efforts are on to document, preserve and share elements of the Punjab that define its remarkable people. Conduct leadership building camps at schools and colleges so the younger generation is exposed to the vibrant culture and heritage of Punjab. Provide opportunity for education and progress to Nihangs, Sikligars and other marginalized segments of society. Master the use of multimedia to connect with our youth. Excellent locations and handsome gursikh models would be shortlisted for movies, documentaries and music videos so Sikhs are presented in the right light. Sava Lakh defines the true essence of the Sikh’s pioneering spirit. The Tenth Master, Guru Gobind Singh, infused the warrior’s resilience in a suppressed community enshrining a moral code that inspires and enthralls. Sava Lakh is a beautiful thought, a sublime philosophy affirming, “One man can make a difference.�? Shastar Vidya : Every Sikh should be trained in the art of self defense. Charity (Dasvandh) - an all-encompassing virtue. Naam Japo (Meditation and Introspection). Horsemanship : Engenders leadership qualities and connects us to our glorious past.